It was followed by Revolution, which he dedicated to his grandmother. For myself this was the highlight of the set. 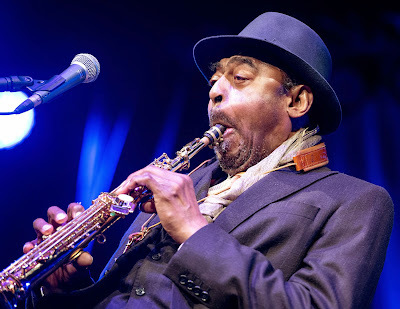 Archie Shepp showed how deep and wide his roots go – into black history on this occasion, since his grandmother was born when slavery still existed in America (he himself has been not only a Professor of Music but a Professor of African-American Studies). The tune is a cry of anger, with a thrilling beatnik-poetry lyric which held the audience spellbound, as bassist Matyas Szandaiplayed a relentless riff over Steve McCraven’s inventive drum rhythms.